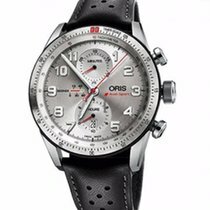 Pre-owned Oris Audi Sport LE Chronograph featured in stainless steel case, automatic movement with silver dial on black leather strap with stainless steel folding buckle. Watch was part of a large watch collection and has only been worn several times. Comes complete with box and papers. Limited Edition to 2000 pieces. Feldmar Watch Company evolved through a legacy of family values that stretches back to the beginning of the 20th century. Through 100 years of determination and exceptional service, Feldmar Watch Company has earned a respected place in the industry while remaining firmly rooted in the history of its past. Our highly-trained staff have sold, serviced and repaired quality timepieces for an entire century. We take pride in the skill of our watchmakers, who regularly work on both cutting edge and vintage timepieces. We are proud to be an authorized dealer for every brand in our showroom. This distinction gives our clientele peace of mind that all warranties and services are guaranteed by both the manufacturer and Feldmar’s trained professionals. When you purchase a timepiece or accessory from Feldmar Watch Company, you receive the very best in products, services and customer satisfaction.